Liébault F. 2003. Les rivières torrentielles des montagnes drômoises : évolution contemporaine et fonctionnement géomorphologique actuel (massifs du Diois et des Baronnies), Université Lumière Lyon, Lyon, France, 375 pp. Available: http://www.theses.fr/en/2003LYO20067. Despite packaging and appearances, nothing we're doing is really new. Some of it might be innovative, but the ideas predate us all. While modern restoration practice chases different fads, and practitioners stumble across techniques new to us, it is easy to convince ourselves we're doing something new and novel. It is important that we learn from history and those before us. We fully acknowledge and appreciate that many practitioners already adopt a cheap and cheerful philosophy in what they do and try to maximize the impact of their actions. As beaver restoration became really popular over the past decade, there was a sense in the restoration community that this was a new technique. As the video below highlights, biologists at Idaho Fish & Game in the 1940s had the same idea. The idea was to use beaver to make better trout habitat and reduce damages from floods, by sourcing nuisance beaver that were flooding vacation homes in McCall, Idaho. Sound familiar? 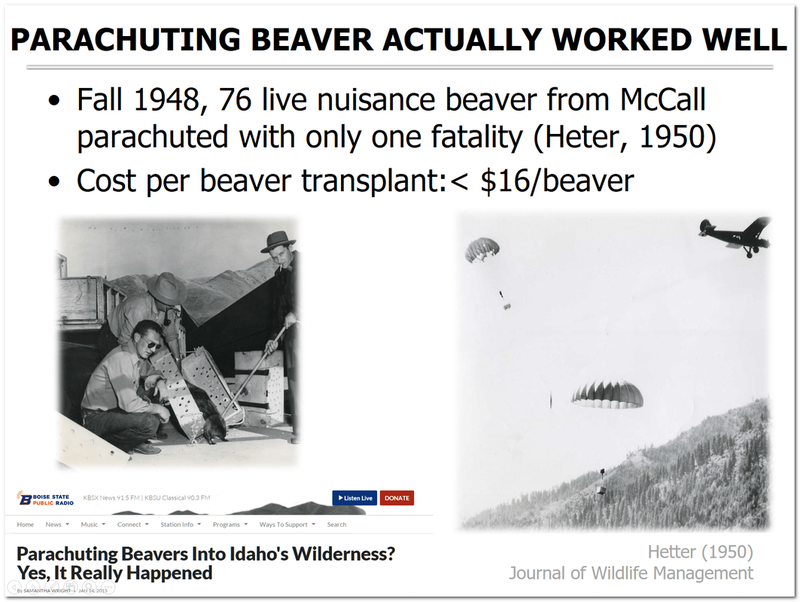 Translocating beaver has been done for over a century... the Idaho example of doing this by parachuting is a nice reminder. These former paratroopers, now employed as game wardens, had a great idea. How could they reintroduce beaver to areas of the Frank Church Wilderness they had been extirpated from, for cheaper than other relocation efforts of the era (i.e. packing beaver in on mules). They were taking an old idea (at the time) of beaver translocation, and thinking how to make it more efficient. BDAs in BC In 1930s? If you really want to convince yourself we're not on to anything new when it comes to partnering with beaver as a restoration tool, read Eric Collier's Three Against the Wilderness. Although published in 1959, Eric describes his family's efforts in the 1920s and 1930s to mimic the work of beaver in British Columbia by repairing the abandon dams left behind from their extirpation in his watershed in the 1830s and 1840s. It is one of the earliest examples we know of, of what you might call beaver dam analogues (though he didn't give it a silly acronym). Eventually, he is able to stop doing the maintenance when a game warden brings him a few translocated, live beaver to introduce to the area. That heading sounds contemporary doesn't it? This is a USFS publication from the 1930s by Kraebel and Pillsbury (1934), that was so useful that the USFS reproduced it in 1980 (still long enough ago for us to have forgotten it again)! Check dams have gotten a bad name in recent year but have been used for centuries successfully. When check dams are built too uniformly, and over-built (built to last) then problems can ensue. When built with a shorter design life (< 1 year), they can work with water really well to invoke the desired geomorphic responses. With beaver dam analogues, it is important not to over build them in the false hope they last forever. In working with NRCS to develop conservation practices for BDAs, we strategically identify BDAs as having design lives of less than a year. Another important difference between check dams and BDAs have a level crest elevation, just like actual beaver dams, as we're often promoting overbank flow and flow around the structures. However, some of these principles of working in stages, and working with processes of erosion and deposition are nicely captured in Figure 17 below and the accompanying text from Kraebel and Pillsbury (1934). 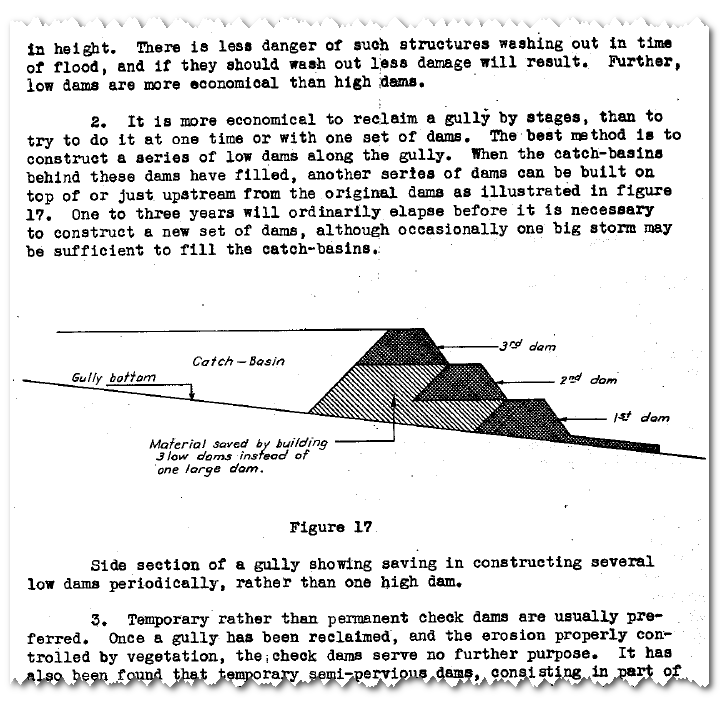 Figures 21-24 of Kraebel and Pillsbury (1934) showing check dams to help stop gully erosion. 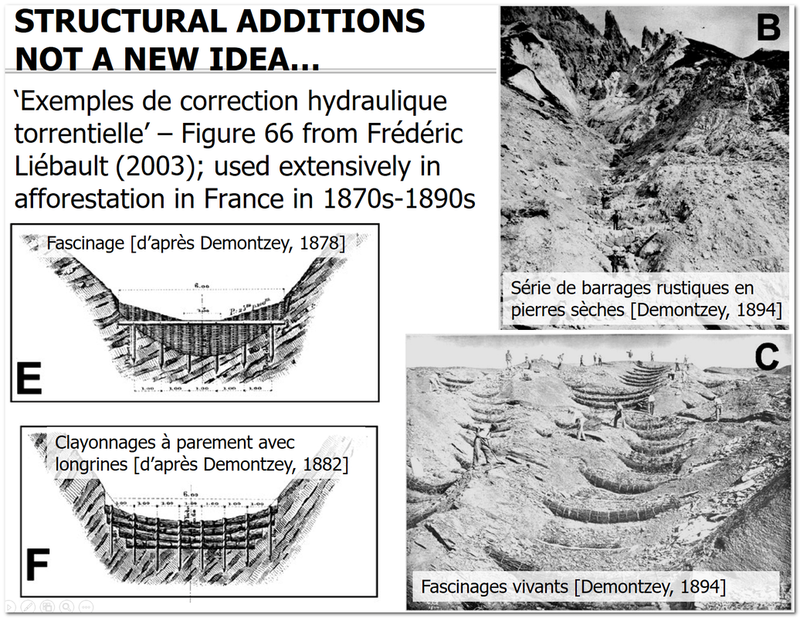 While check dams can be overbuilt and ineffective, they emphasize here simpler structures, built with natural, on site materials (similar to the French). Kraebel CJ and Pillsbury AF. 1934. Handbook of Erosion Control in Mountain Meadows, U.S. Forest Service, California Forest and Range Experiment Station, Berkeley, CA, 69 pp.